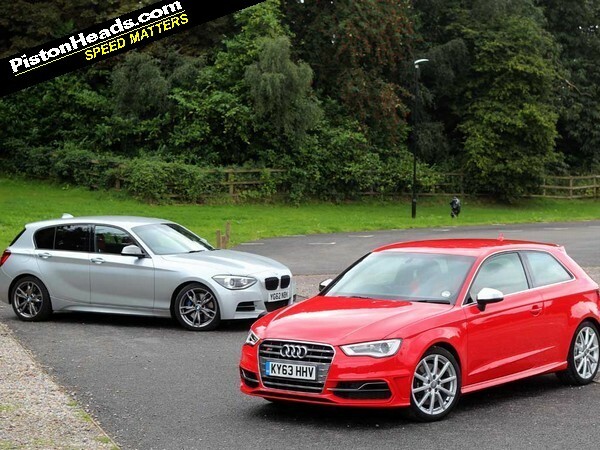 All-new S3 is M135i's closest rival in spirit, price and spec ... or is it? 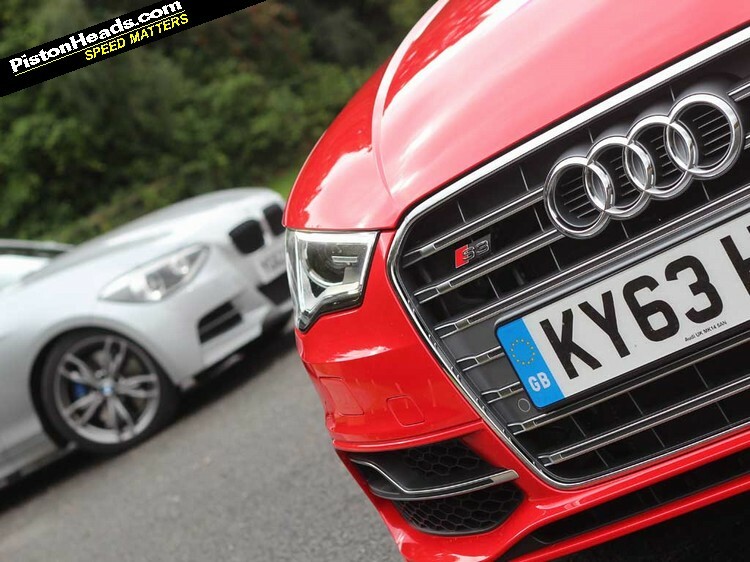 With a UK press launch pack brimming with comparisons against the M135i and Mercedes A45 AMG it's clear that, in lieu of an RS3 as yet, Audi is sending the S3 into battle against both. 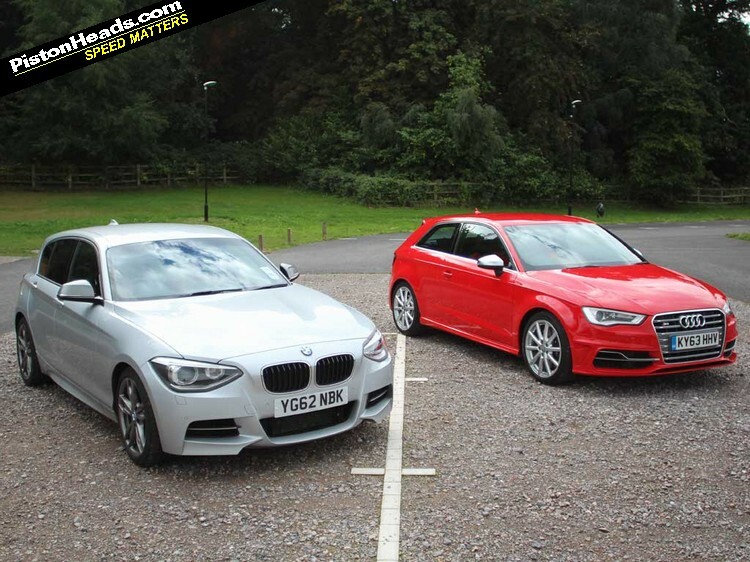 In the case of the 'M Performance' BMW that makes more sense, the S range likewise sitting beneath the top tier M and RS models. 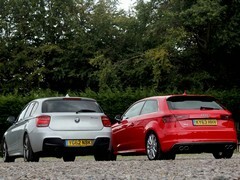 So it shows some boldness on Audi's part that it reckons the S3 can also go against a 'full fat' AMG like the A45. 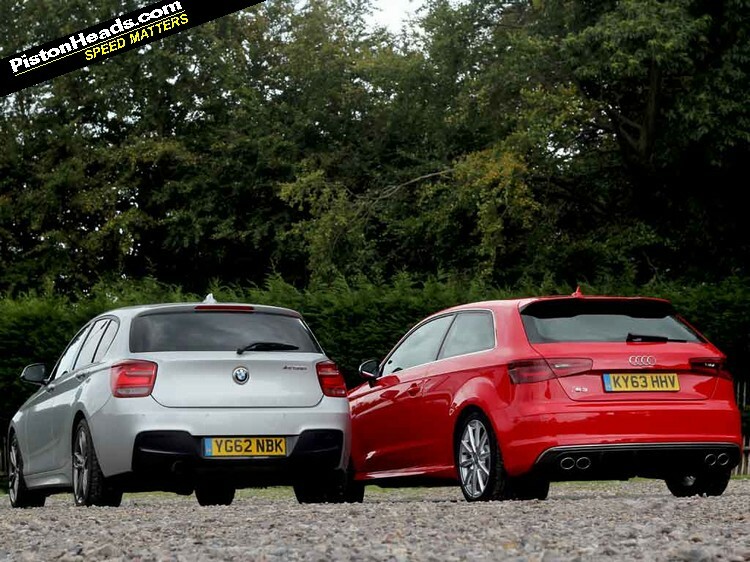 That comparison can wait for another time; for now the M135i faces its closest on-paper rival yet in our series of mini-tests. 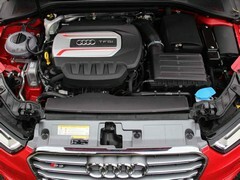 We drove both a three-door manual S3 and a specced-up five-door Sportback with dual-clutch S Tronic and all the trimmings. 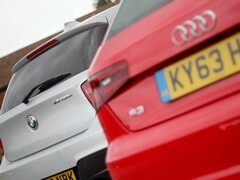 And though they share a badge they feel very different cars. The three-door feels like a mature hot hatch, albeit one with a 300hp punch, while the five-door has the air of a much more grown-up family car. Albeit a very fast one. 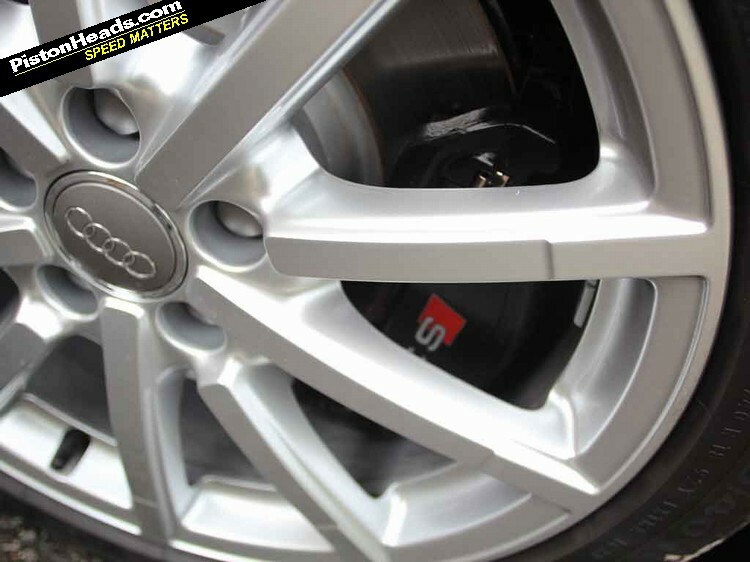 The manual car's slim, flat bottomed wheel and characteristically light-actioned and precise shift are all familiar Audi features, likewise the fierce grab from the brakes and brittle springing at low speeds. The engine pulls strongly from low revs, with little sense of lag and a muscular mid-range but it doesn't feel 10 per cent up on power compared with the Megane 265 or Focus ST. And lacks the M135i's 'OMG' punch. It also seems to headbutt its limiter very hard and about 500rpm sooner than you expect, the traditionally undersquare design happier at low revs than close to the redline. Which, unfortunately, is just where the BMW has a glorious finale to its power band, its revvier oversquare nature and six-cylinder balance really coming through. On a test drive that'd seal it, especially if you've got the Audi in the 'Dynamic' engine noise mode that sounds more like a misfire. The S Tronic flatters to deceive more effectively, delivering a crisp dual-clutch whump at peak revs but its six ratios seem a little archaic compared with the BMW's eight-speed auto. Audi's been listening to complaints about hard ride set-ups though, both the standard dampers and adjustable ones on the Sportback striking an acceptable balance between 'sporting' firmness and bump absorption and poise. Four-wheel drive does give the Audi an all-weather advantage over the tractionally challenged BMW, which will give you a lot of flashing lights on the dash when it's wet. But while fun to hustle along and effectively fast, there's little thrill factor at the Audi's wheel and it doesn't inspire like the M135i can along the same piece of road. 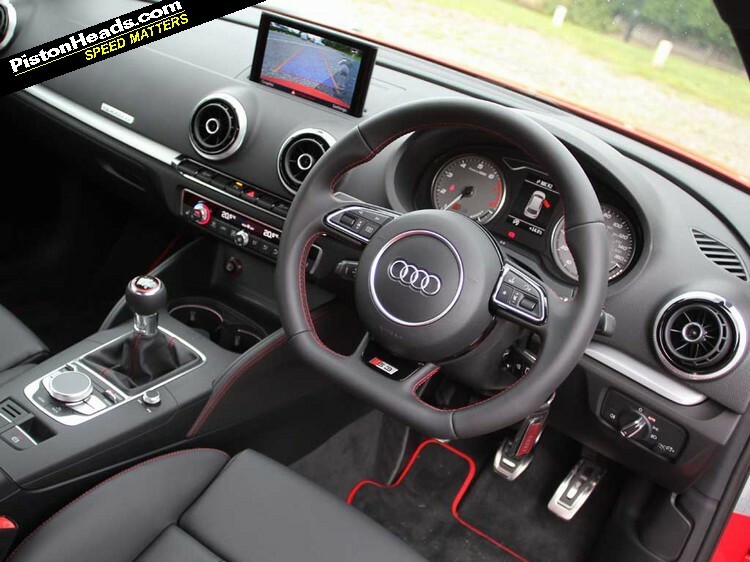 Much praise has been heaped on the new A3 range's more minimalist interior style and it successfully combines traditional Audi conservatism with a more youthful and 'now' sense of modernity. 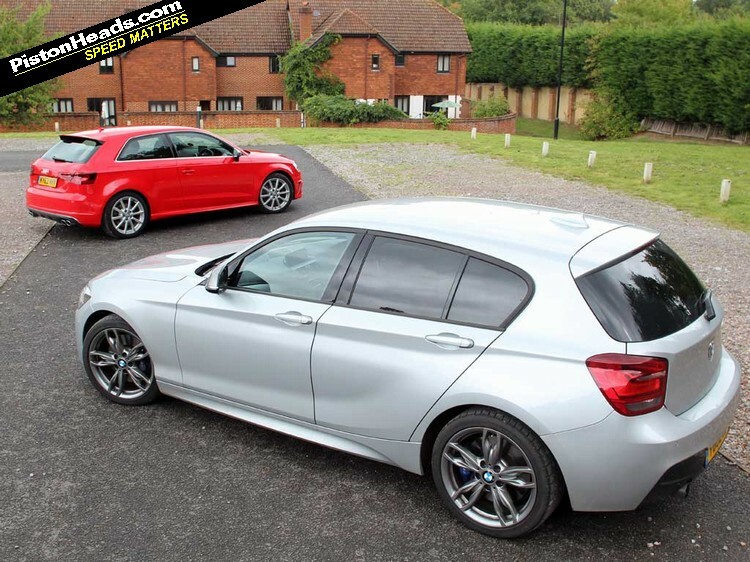 From seating position to some of the plastics it's hard to escape the sense you're in a posh hatchback though, the BMW more convincing in the premium feelgood factors. Little things like the fact the shifter paddles in the Audi are chromed plastic and those in the BMW cool to the touch aluminium underline this, though the bells and whistles spec Sportback we drove was much more convincing in its premium ambitions. At a price. 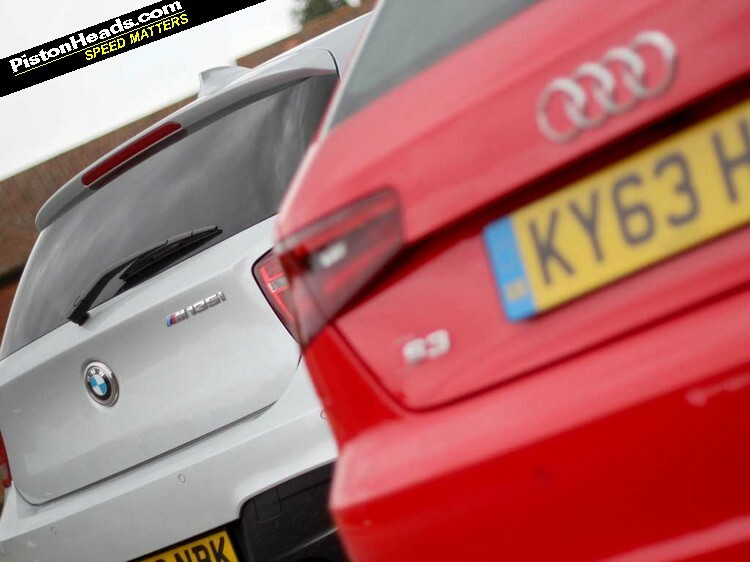 The 1 Series' looks remain divisive and the fact your colleagues and neighbours won't be able to tell the difference between your M135i and an entry level 114i will rank it hero or zero according to taste. The S3 is restrained - it's still an Audi - but the quad pipes and S branding are relatively speaking much more overt while remaining tastefully more mature than shoutier hot hatches like the Megane. The acceptable face of go faster branding, if you will. 'Civilian' non car folk will probably be more impressed by the Audi, especially blinged up with a few extras like the red seats of our manual car or the quilted 'Super Sports' ones in the Sportback. But that's not really the PH way - is it? No getting away from it, the BMW is a selfish choice based around the driver. 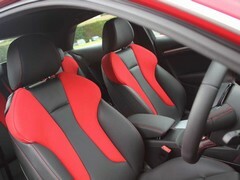 Front seat passengers will probably be telling you to slow down, rear seat ones moaning about the lack of leg and head room. And the fact the shopping that should be in the boot is probably in their lap. There are benefits to being based on VW's MQB hatch platform though, with space and practicality definitely on the S3's side. Simply put, it's more likely be the one to get universal household approval. Against that the BMW's soothing multi-mode character and ability to cruise languidly in Eco Pro, slurring its way through the eight-speed auto, does make it a comfy mile muncher if you're flying solo. Do they compare on price? Do they REALLY compare on price? 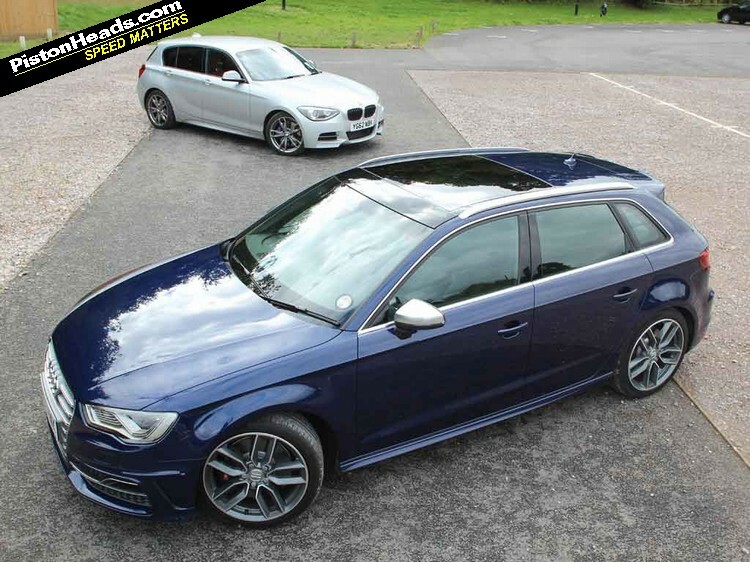 The fact the bottom line on the five-door Sportback we tested starts with a '4' is probably the first shocker in this comparison, though it's fair to concede that this car was a fully laden press car with all the toys. 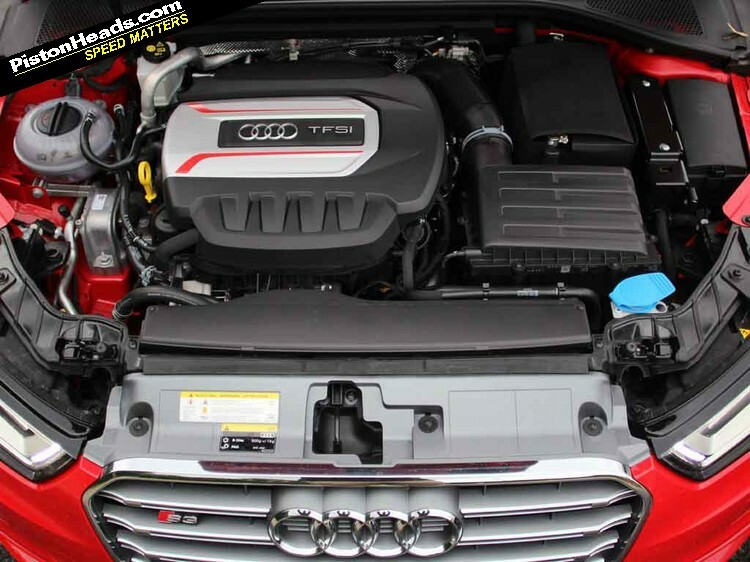 But the fact the S3, already on the back foot for power and punch in the guts performance, can weigh in with a 10 per cent price premium over a generously specced five-door auto M135i is eye opening. Doubly so when you consider the A45 AMG, again faster and with a standard dual-clutch gearbox, starts at £37,000. Have a browse of the full options specs and prices below and make your own decisions about what's necessary and what could be trimmed. But it's hard to escape the fact the S3 quickly blows any price advantage with a few options ticked. 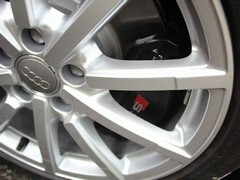 The S3 is a great car by any measure. Well, any but this one sadly. In all but practicality and, to some eyes, pose value it's hard to escape the fact the M135i thumps it comprehensively across the board. If you need a more family orientated premium uber hatch the Sportback will be a much more convincing sell than the more self-centred BMW. But for the kind of feelgood factors we're looking for it's not a hard one to call. 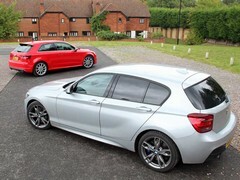 BMW M135i vs ... the world! This is so massively frustrating to me. The BMW is an impressive car, but it looks hideous (personal preference fine, but important). The Audi is, well, £40k plus. No. Just no. I won't paste pointless links to various Audis in the classifieds, but if I had £40k to drop on an Audi, it wouldn't be on a brand new A3. R8? RS4? Lift the Audi shell off and drop it over the BM please. Problem then solved. Both far too bland on the exterior for my liking. If paying that sort of price for a car I want one that looks special and turns heads (as well as being a great car to drive). 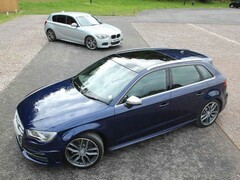 Waiting for the S3 saloon which is due out next year and looks far better. If it had to be an Audi, I'd take a 3 year old RS6 for that amount.